Being a mom has changed my entire life. One thing that has changed is that I often have to eat one handed and on the go. I don’t have time to make a hot breakfast and sit down and eat it so I’ve been looking for easy breakfasts that don’t need to be warmed up. Since it’s fall I’ve also been looking at delicious fall flavors like pumpkin and apple. I found a recipe for pumpkin oatmeal cups that had cranberries and chocolate in it. The oatmeal is good because it’s filling and the cups can be stored and eaten at room temperature so I was sold on them. When the baby was sleeping I ran into the kitchen and whipped up a batch of these. It said it made 2 dozen oatmeal cups but I found it more to be along the lines of 18 cups which was just fine. 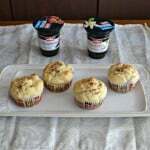 They were easy to make because everything is placed in a bowl and mixed together then is put into muffin cups. I will say that these oatmeal cups don’t look pretty. They are a little bit lumpy and each one looks different. 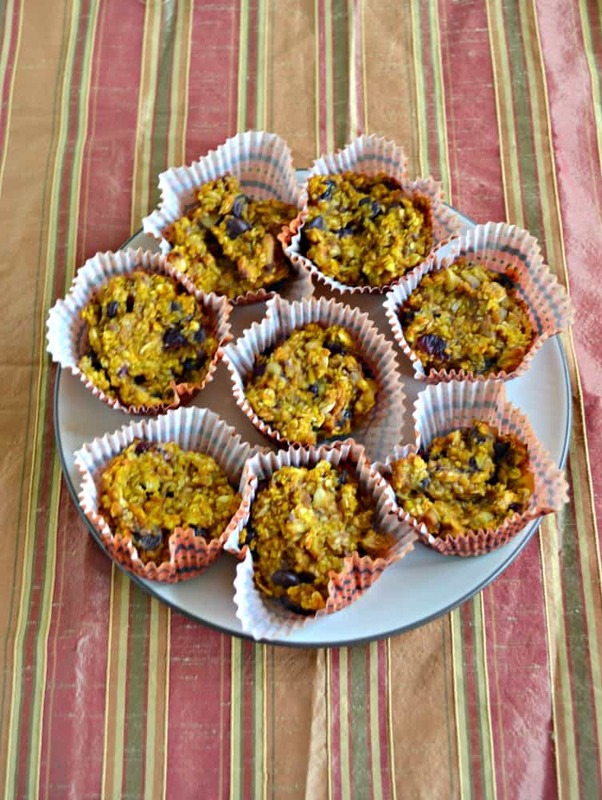 They are studded with the cranberries, chocolate chips, and flax seeds. I would grab two every morning with my coffee and they were really filling and tasted good too! 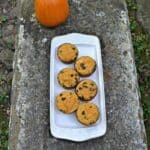 The oatmeal cups have a chewy texture and taste like spices and pumpkin. 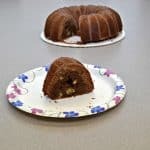 The cranberries add a bit of sweetness and flavor while the chocolate chips add a nice richness. 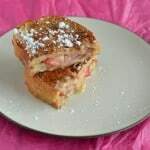 This is the perfect breakfast for those that need to eat on the go or that can’t have a hot breakfast. 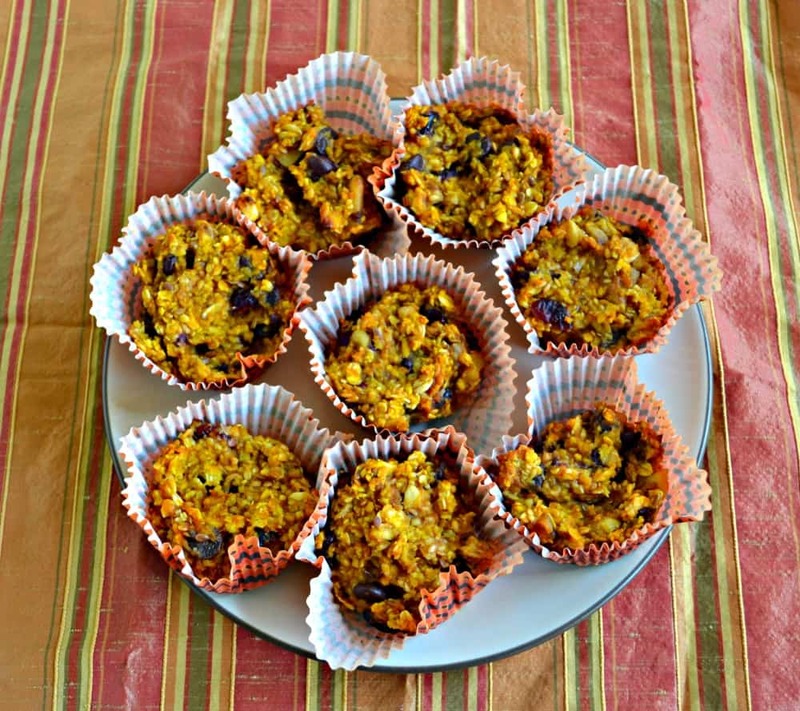 Fall flavors are in the air with these tasty Pumpkin Oatmeal Cups studded with chocolate chips and cranberries! 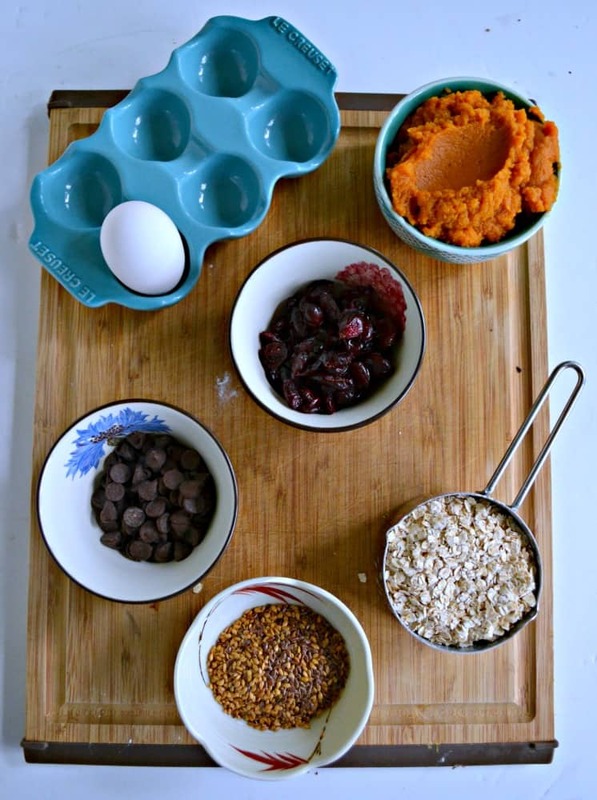 In a medium bowl combine the oats, craisins, chocolate chips, walnuts, flax seed, baking soda, salt, and pumpkin spice. Mix well and set aside. In another medium bowl combine the egg, pumpkin puree, honey, milk, and vanilla. Mix well. Add the wet ingredient to the dry ingredients and mix until combined. Spoon the mixture into the prepared muffin cups so that they are ⅔ of the way full. Bake for 30 minutes or until they cups are cooked through. I remember those days of doing everything 1 handed. I had hip babies. They were always on my hip. Now they have slings, perhaps that is an answer for you. In the meanwhile, enjoy these tasty treats you made. 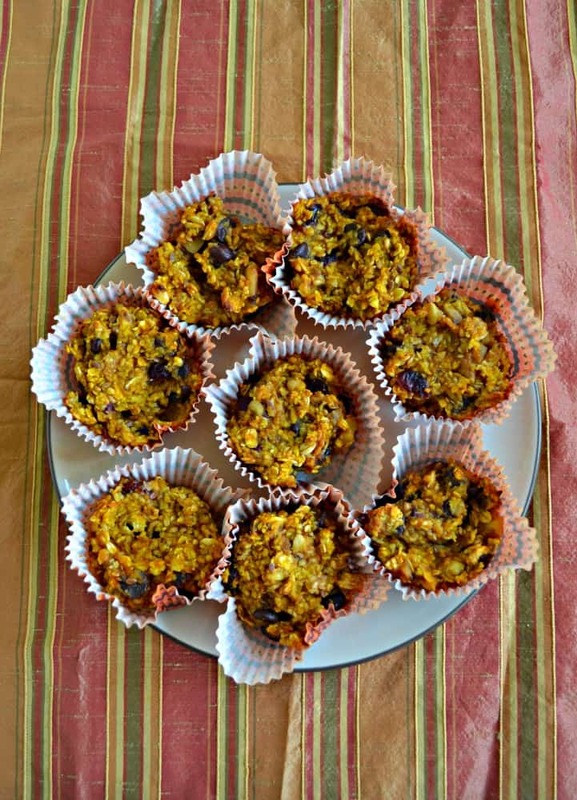 No matter how they look, these oatmeal cups sound delicious!!! Yeah, I think all us moms can relate—although I don’t know if I could have kept up with a blog when mine were wee ones. You’re rockin’ it! Thank yoU! It’s hard keeping up with it but I had a lot of posts written and photographed this summer so I could keep up! What a perfect on-the-go breakfast. I think they look rustic and tasty. It feels like yesterday I was doing everything one handed with a baby on my hip. Now their both grown and living on their own. Enjoy every moment while it lasts.